Isabelle had a dream that one day she would walk like other children. She had been born with both feet severely deformed and curled under, so she learned to walk on the tops of her feet. The object of cruel teasing, 10-year-old Isabelle scarcely lifted her head as she dragged herself from place to place. Then one day, a screening team from the Caribbean Mercy visited Isabelle’s village. After examining her bi-lateral club feet, they explained to her family how her congenital condition could be corrected. Isabelle’s hope for healing had sailed in with the Mercy Ship. Orthopaedic surgeon Dr Tim Browne had left his practice two years earlier to volunteer full-time with Mercy Ships. He brought specialised training in orthopaedics – and the addition of new types of surgeries that previously had been impossible for the team to perform. 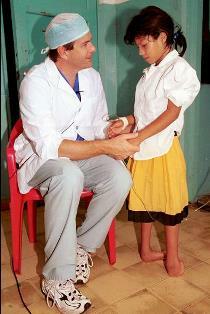 Dr Tim worked long hours with local surgeons in the operating room of a nearby hospital. They corrected and turned Isabelle’s feet the correct direction which would allow her to stand correctly and wear shoes like other little girls. Isabelle’ radiant smile was full of joy; her dream was within reach. A follow-up visit to her El Salvadorian village a year later in 2000 found Isabelle able to walk and wear shoes just like the other village children. Isabelle was stepping confidently into her new future.